The 24.3 metre motor yacht Trysting Place Too, listed for sale by Charles Blickle at Denison Yacht Sales, has had a further $76,000 price reduction. 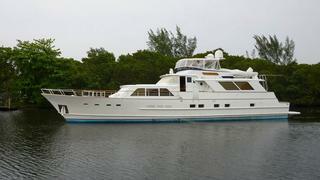 This latest reduction means that the yacht has been reduced by $250,000 since she was first listed for sale. Built in aluminium by US yard Burger Boat Company, she was delivered in 1982 and was fully refurbished in 2013, including a full paint job. A cockpit was added in the mid-1980s at the Spencer Boat Company (now Rybovich Marine) in West Palm Beach, Florida, supervised by the Burger Boat Company. Accommodation is for six guests in three cabins consisting of a master suite and two identical twins to port and starboard, all with en suite bathroom facilities. Large yacht features include Naiad stabilisers, a Wesmar hydraulic bow thruster, and a ‘country kitchen’ galley. The flybridge offers upper helm steering with helm and companion chairs and full instrumentation forward. There is also built in bench seating and a table just aft. The main saloon of this yacht for sale is full width with a built-in wet bar along the forward bulkhead and comfortable seating is aft to port and starboard facing an entertainment centre. Sliding glass doors lead out to an expansive aft deck featuring seating, an electric grill and all the conveniences necessary to enjoy al fresco entertaining and dining. Next aft is the teak-decked cockpit with a transom door, storage, Jenn-aire electric grill and cockpit controls. Twin GM 800hp engines give her a cruising speed of 16 knots and a top speed of 19 knots. Dension Yacht Sales has confirmed that the "owner is extremely motivated to sell". Trysting Place Too is now asking $399,000.